paul gregutt's washington wine blog – unfined & unfiltered: barefoot sham-pagne? The blogosphere lit up like a Christmas tree a few weeks back, as self-righteous post after self-righteous post attacked Sea Smoke for having the audacity to label its new releases “California Grand Cru”. Now you may agree with me that the winery miscalculated from a PR standpoint – facing not just the ensuing hubbub, but the lingering impression of having made an unseemly, or at least unearned boast. But Sea Smoke did nothing illegal, and as I see it, nothing especially different from labeling an $8 bottle of plonk “Winemaker’s Reserve” or some such frippery. A far more annoying, though still technically legal, gambit is the (mis)use of the word Champagne on certain cheap and cheerful California bubbly. Korbel has been doing this for years, and seems unlikely to change, but their labels are modest compared to what showed up on my doorstep yesterday. Barefoot Bubbly Pink Moscato CHAMPAGNE reads the bottle, one among several with similar bold assertions of false provenance. Yes, California is on there also, in fancy script. It’s tucked away in a line that reads (script) Sparkling CHAMPAGNE (script) California. As if somehow that makes sense. It is now illegal (with exceptions, of course) to call anything Champagne that isn’t from Champagne. But this stuff isn’t even on the same planet. 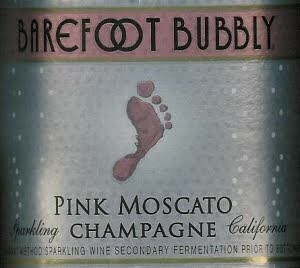 These Barefoot Bubblies are not made from approved Champagne grapes, nor are they made in the Champagne method. The Brut Cuvée, for example, is composed of 73% chardonnay, 10% burger (!?!) and 17% “mixed white” (grapes? one hopes). The Pink Moscato is Gallo’s newest entry into a rapidly expanding category that combines sweet, pink and bubbly trends all in a single bottle. Nothing wrong with that – except it is NOT Champagne! Nor is the White Zinfandel Champagne, the Pinot Grigio Champagne, the... you get the drift. 1. Barefoot Wines were originally introduced in 1965 by Davis Bynum. The name ‘Barefoot’ was chosen to pay homage to the original way of making wine by crushing grapes barefoot. 2. In 1985, Michael Houlihan and his partner Bonnie Harvey bought the brand from the Bynum family. They introduced sparkling wines such as Barefoot Bubbly Premium California Champagne and Brut Cuvée California Champagne in the early 1990's. Current winemaker Jennifer Wahl was hired in 1995. What it boils down to is this: Gallo is legally grandfathered in to continue to abuse and disrespect the term Champagne. It may be legal, but in every conceivable way it is wrong wrong wrong! And the largest family-owned winery in the world ought to be able to marshal up the courage and class to do the right thing and drop the word Champagne from the label. I say we should boycott this brand, but I doubt anyone that reads this blog actually drinks it. It is definitively wrong. I find the font treatment on the label interesting. It clearly separates the word California from the word Champagne so that a natural reading of the label is: Pink Moscato Champagne. The word California is expressed in a separate and subordinate way, and I suppose it could be argued that it isn't very clear on this label if the producer is saying that champagne is a place or something else. Still, it sparks a compelling etymological discussion. All words' usage evolves, so its possible that in certain parts of the world to a great many people, the word champagne simply doesn't denote a place. It means a glass of sparkling wine. If that's true (and I'm not at all sure that it is), at what point do you stop swimming against the tide and adopt the common usage as correct? Or at least acceptable under certain circumstances? I love Champagne--the real Champagne--so I side with you, Paul, on this, certainly. But I suppose I can see the other side's perspective too. Steve, in some respects, you are correct. But in the wine world there are very strict, recently-enacted trade agreements, designed to protect such regional products as Champagne, Port, etc. from infringement. So it is illegal for EU members and co-signers to EU trade regulations (such as the U.S.) to mis-appropriate such terms. Gallo and Korbel are grandfathered in as exceptions, as I state. However, that doesn't make it right. And if consumers confuse the term, and many do, it is a problem to be addressed, not something to shrug off as just a different perspective. Thank you very much for writing this post, Paul. It is embarrassing that the USA still allows this deceitful labeling practice to continue. I understand the grandfather clause, but both Russia and Australia had the same laws, and then abandoned them this year out of respect for Champagne. The USA should do the same. What would happen if some winery in the mid-west called their wines, Walla Walla mid-west wine? It would not be allowed, and the same standard and respect should be held for international regions. Oh, come on. When my nose runs, I reach for a Kleenex, even though the box says Kirkland. If I cut myself, I never reach for a sticking plaster, nor a Curad, even if that's what the box says. I understand the legal consequences that surround brand names (remember Quail Run). When I pop a bottle of Gruet bubbles, I'm still transported to the mental land of the beverage champagne. And when I open a bottle of White Star or Yellow Label VC, I'm not carried to Rheims. Now, a good grower-producer bottle does put a capital C in my mind's eye, and so does the price tag. If a single-digit priced, bulk process bottle from California chooses to besmirch the sacred chalklands of AOCdom, I'm not confused, nor abused. And "Port" as a geographic brand is even more restrictive. Port is, or should be, the name for the process that preserves sweetness by sterilizing partially fermented wine with spirits. Cheap port, made in Douro Valley, or Modesto, is still a cheap drunk, and not readily confused with vintage, 20-year tawney, colheitas, or other pricy and tastey juice from Portugal. So, Paul, maybe it's wrong, but just once. Paul, I guess I make a stronger distinction between legal usage and common usage. I'm just plain curious about where the tipping point lies between what the public wants to call a thing and what a thing wants to be called. But that's purely my own weird curiosity. I didn't mean to diminish how important the legal issues are. On that, I think Mark misses the point. It's one thing for folks to casually call their sparkling wine champagne and their tissues Kleenex. But it's something entirely different when the term goes on the bottle or the box because then you're talking about countless people's blood, sweat, tears and money. And as you say, that matters. Also, Gallo and others are complicit in the mess. On one hand, it's: "Everyone is calling all sparkling wine champagne, so why can't we call our sparkling wine champagne?" On the other hand, they spend millions in marketing each year reinforcing the erroneous usage. Gee, I wonder why people are confused? It's pretty simple. Don't put Champagne on non-Champagne wine (make it a law if necessary to protect the rightful "owners" just as trademark law does today), and expect that most everyone will still call it champagne, just like we do with xerox, kleenex and band-aid. There's a reason these brands are stuck in our heads even when referring to generic or competitive products. Businesses protected their brand name and successfully marketed a consumer-friendly product, and they should reap the rewards of their effort. Let Champagne have the same rights. Barefoot should not benefit from Champagne's successful name, they should create their own. All your points here make sense, but the fact that trumps all sentiments is that Champagne is a legally grandfathered term for Korbel, Barefoot and (I believe) a handful of others. I think opponents of American wineries using the term would have more right to complain if those products were closer in price to French Champagne, as that would result in much more confusion. In my experience dealing with consumers on a regular basis, the awareness that "real" Champagne only comes from the Champagne region of France is actually quite broad/deep. THere are lots of terms that are way more problematic (e.g, Reserve). Tish, you are correct, and nothing illegal is being done. But just because they have the legal right to abuse the term does not mean they should. If the price difference is a defining factor (not for most people, but I'll go with it) then why bother to put CHAMPAGNE in caps on the front label? They are clearly trying to get some marketing buzz from the term, and in so doing they are contributing to ongoing confusion and dilution of one of the most important brands/regions in the world. Not right! They don't need to clamp onto a bogus name to sell their fizz. Show some respect! Actually, it's not just a handful of wineries that are grandfathered in. In fact, "Port", "Champagne" and others are still widely used in the local winery market. All it takes to be grandfathered in is that the winery used the name and had it approved by TTB before the EU agreement took place. If an approval is on record, often a new approval isn't even NECESSARY unless there's a change to the alcohol content or other mandatory information. This is an example of the Sarah Palin'ing of the wine biz...where undereducated and underinformed becomes and remains OK for some bizarre reason. Let's appeal to the lowest common denominator, and if they stay dumb as a result, what the heck, right? Gallo knows exactly what they are doing and who they are appealing to with a bottle like this, and as the first comment states, none of us who would read PG are drinking the stuff ourselves. But really, isn't the primary name "Barefoot Bubbly" and some descriptor like "Sparkling Moscato", along with the obvious bulbous cork and foil, enough to send the message as to what's in the bottle?! Not to Gallo, I suppose - who probably can't remember the name of that 3rd federal agency that they hate, either.